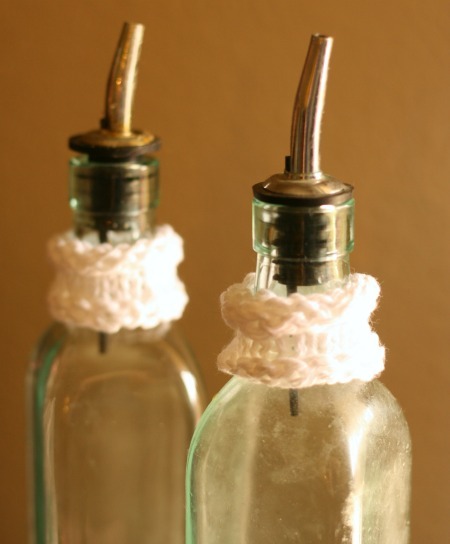 You know when you crochet or knit… or both… then you quickly realize you can make all sorts of home accents for yourself. That kind of power can really go to your head. It starts out with a practical washcloth or two. Then maybe you step up your game with a decorative pillow cover. And before you know it you’re making a toilet paper cozie. Knock yourself out! If you want a cozie for the spare toilet paper roll that lives on the back of your toilet go for it. Being able to crochet or knit… or both… is very empowering. Its your super power. You use it to make whatever you like. But perhaps I’m only saying that because I’ve spent the past 48 hours making little home stuff instead of working on my summer tee. I got this wild hair and I just wanted some new stuff to lighten up the place. I considered a trip to a local home supply store for 30 entire seconds. Then I remembered how much I hate shopping, how much I love making things with yarn, and decided to just make what I wanted. I wanted some of those drip catchers for my vinegar and oil drizzly bottles. (Those bottles probably have a real name but I don’t know it. I just call them my drizzly bottles and I feel like a total pro in the kitchen when I’m drizzling with them.) These drip catchers are dead simple to make. Like them? Me too. These are so freaking cute and yet still practical. (Yes they are, very practical. At least as practical as a toilet paper roll cozie.) You just cast on how-ever-many stitches, knit a bunch of rounds, and cast off. But if you like the safety net of a pattern, check out Becky Kibblewhite’s Tea Spout Drip Catcher. Next up was a mat to sit under a certain Feline Overlord’s food plate. I sort of, accidentally, with all the best intentions, half melted her last rubber mat in the dishwasher. I had been meaning to buy her a new one but, nah, I’ll just crochet something! I used a stitch that Moogly calls Granite Stitch. Its simple but pretty. You can find her tutorial with written instructions and video tutorial right here. Let’s test drive that food plate mat. Yep. Seems to work just fine! But I wasn’t satisfied. I needed more home-y stuff. I needed a new coaster for my desk. So I went to ravelry to browse the coaster patterns and, ahhh, came across my own pattern for leaf coasters and actually thought “oh yeah those are pretty. I should just make my own coaster”. I am a real ditz sometimes. So I whipped out a leaf coaster. And took it for a test drive. Yep. That one works too. And everything got made in tough, white cotton. That cotton that can go through the laundry with enough bleach to keep it looking new and white. I feel better. I think I’ll get back to my summer tee now. 17 Comments on "Independence through yarn"
I love your leaf coasters and place mats! I’ll be knitting some of these for sure. LOVE this post! I also got on a “little house stuff” this week! Monday I was going to my knitting group and got really annoyed at my sweating water bottle, so I grabbed some cotton yarn and crocheted a water bottle cozy at “knit” night. Now I’m getting ready to make place mats! Oh, yeah.also made some dishcloths! That is exactly what I’m talking about. When you can make things with yarn, you look around the house all you see is future projects solutions. I like knitting little dish ‘sponges’. It’s so satisfying to go to the drawer, grab a clean one, & put the old one in the lingerie bag under the sink! & that’s my car knitting, too. Needles & cotton in a bag, living in my car, ready to crank out more sponges. How cute! 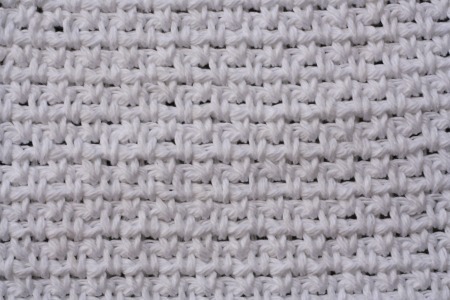 A crochet version of the ballband dishcloth. It is satisfying to always have what you need to make what you want.